A time to stop and savor our local plants. Cheryl Lisin, our expert on all plants local, fills us in on one of Humboldt’s great beauties. When the rain starts in the fall, the bright green fronds of the California polypody fern appear. They stay lush and green until the weather turns summery, when the fronds wither and disappear. Polypodies grow from rhizomes on moss covered tree trunks, logs, rocks, cliffs and sometimes even dirt, expanding to form large patches. On the underside of the fronds you can see the sori, small bumps containing spores. When conditions are right, spores will grow into new plants . A common name for polypodies is licorice fern, as the rhizomes taste like licorice. 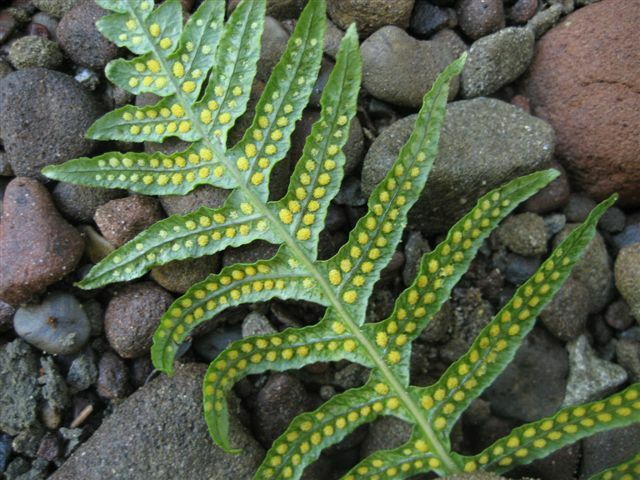 The scientific name is Polypodium californicum and it is in the family Polypodiaceae. Share a little nature with us. Upload a photo of your favorite Humboldt plant into the comment section so we can slide on down to the weekend with a glimpse of nature. See hints on how to do that here. Be sure to refresh after uploading for best results.) Also, please tell us where the photos were taken if possible. If you have another Humboldt image that doesn’t fit the plant theme but would still like to share it with everyone, send it to mskymkemp@gmail.com with Featured Photo in the subject line.